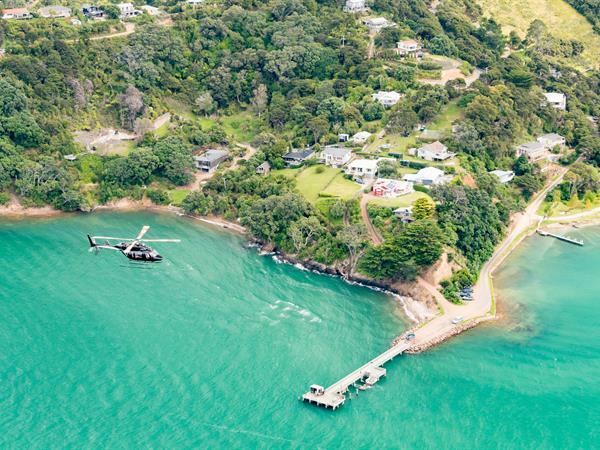 Lifting off from our downtown heliport at Mechanics Bay you will fly eastwards past Browns Island volcanic cone and Motuihe Island nature reserve, to beautiful Waiheke where you will cruise along it’s south coast bays and peninsulas. The eastern portion of our tour takes you over Ponui, Rotoroa and the stunning white beaches of Pakatoa, each island having its own unique history and land use, then back over to Waiheke and the Stony Batter historic reserve and defence complex. Flying back along Waiheke’s north coast will take you past Onetangi, Palm Beach and Oneroa, plus a number of other less accessible small bays and beaches, before hopping over to have a look at Rakino and the Noises, past Motutapu and over the summit of the regions newest volcano Rangitoto. Returning to Mechanics Bay offers you views across the North Shore and then a closer look at North Head and Devonport as we make our final approach into the heliport. Flight duration approximately 25 minutes. Click Here to Let us help you organise an experience with us.